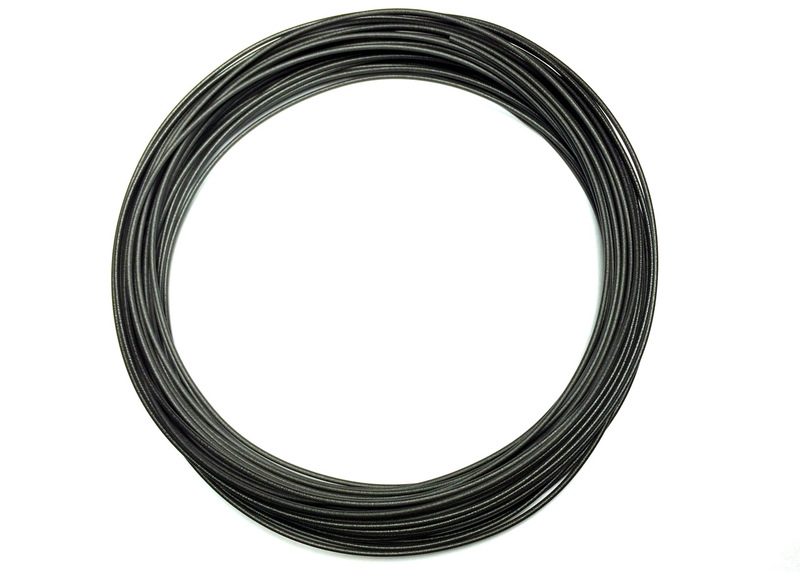 The European filament manufacturer ColorFabb has announced the release of a new special filament using carbon fibers mixed with thermoplastic material that should be as easy to print on most 3D printers. ColorFabb XT CF20 is a copolyester based carbon fiber composite material that is based on the unique Amphora 3D polymer from Eastman Chemical and is reinforced with 20% specially sourced carbon fibers, making it perfect for printing parts which need high stiffness. Combining carbon fibers in filaments material is not a new idea, but ColorFabb has been able to combine a lot of desired properties into 1 new material. Still the company does warn users that due to the abrasive nature of the carbon fibers using this new filament will accelerate the nozzle-wear of brass nozzles, much faster than other standard types of filaments, so they recommend to use nozzles from Stainless steel or hardened copper alloys. The ColorFabb XT-CF20 special filament with Carbon fibers is already available for pre-order with the first orders expected to start shipping at the end of February. The price of a single spool with a weight of 750 grams in either 1.75mm or 2.85mm diameters is €49.95 EURO or roughly $57 USD. This makes the price of the Carbon fiber reinforced filament from ColorFabb pretty much the same as the one that the USA-based Proto-Pasta sells their Carbon PLA filament. The advantage here is that ColorFabb is based in Europe and if you order from Europe it should come cheaper than if you get the USA product, however although the two filaments seem very similar there are some differences. You should be aware that the Proto-Pasta Carbon PLA filament that we have already tested recently is mixing carbon fibers with PLA, but ColorFabb is using the Amphora 3D polymer instead and thus it has slightly different properties. The Eastman Amphora 3D polymer is a low-odor, styrene-free choice that is uniquely suited for 3D Printing applications. With Amphora, makers can create items that are more functional, durable, efficient, and attractive. Amphora also complies with certain U.S. Food and Drug Administration (FDA) regulations for food contact applications. 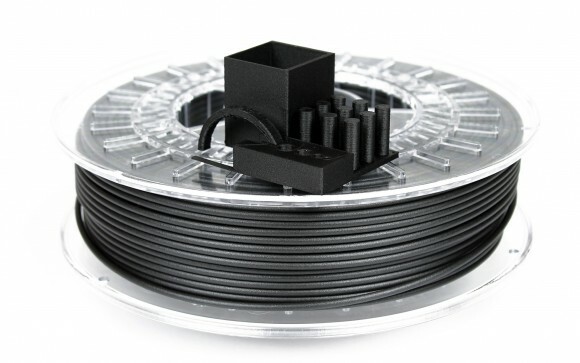 The XT-CF20 Carbon filament as well as other ColorFabb XT-Copolyester based filaments are supposed to offer stronger and more detailed parts, offer higher temperature and better chemical resistance as compared to standard PLA filament. The side effect is that you need to use higher temperature of the extruder when printing, 240-260 degrees Celsius are recommended with printing speeds of 40-70 mm/s and the use of a heated build plate is also advised. 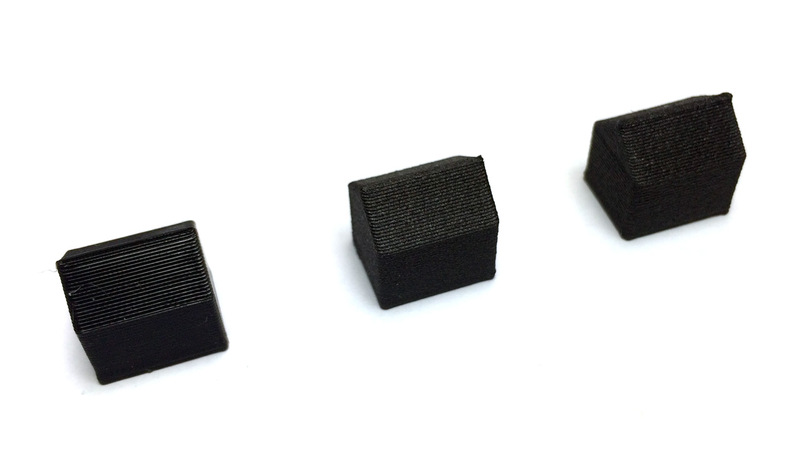 This means that you need higher temperature, a bit slower printing speed and a heat build plate for best results – things that are not required for PLA-based Carbon fiber reinforced filaments, although the heated build plate may not be required. We are going to be testing ColorFabb XT-Copolyester 3D printer filament soon on out Makerbot Replicator 2 3D printer that does not features a heated build platform, so that we can see how well these filaments will work in our case. ColorFabb recommends that you disable the extruded filament cooling fan of 3D printers that are not equipped with heated build plate when using their XT filaments for the first centimeter and/or using rafts in order to get best results. If the Amphora 3D polymer used in the ColorFabb XT-Copolyester filaments does indeed work well with no warping when not printed on heated build platform we do plan to also try out the new ColorFabb XT-CF20 Carbon Fiber filament when it starts shipping. On the image above you can see a test 3D print from standard black PLA filament on the left and then two test prints from the Carbon Fiber PLA material to the right, one printed at 230 and one at 250 degrees C. The standard PLA print is with a glossy and smooth surface, the Carbon Fiber PLA prints are with a bit rougher matte surface and are more lighter black than standard black PLA. We have started our testing at 190 degrees C, but we’ve had trouble with the filament sticking to the build plate properly, so we continued increasing the temperature and all the way to 210 degrees we had problems with the layers sticking (with properly leveled build plate). Going for 220 degrees Celsius all the way up to 250 has managed to produce good prints on our MakerBot Replicator 2 3D printer with prints at 230 degrees Celsius being the most problem free and with the best quality. We had no trouble with warping as expected and the adhesion was good, but you may need a bit higher temperature of the extruder to avoid problems with the material sticking to the build plate. Our initial impressions from the material are pretty good, now we need to print some parts for RC models to stress test the filament as apparently a lot of people are using the Carbon Fiber PLA material for remote controlled models.